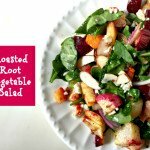 A delicious, colorful and healthy salad highlighting Fall's best root vegetables, blue cheese and almonds. Spray a large cookie sheet with cooking oil. Add your veggies, garlic, thyme, olive oil, salt and pepper and mix well with your hands. Cook for 40-45 minutes until the vegetables are tender and starting to brown. In the meantime mix all the salad dressing ingredients together in a bowl and set aside. Next prepare your spinach in a big bowl. Toss with dressing (use as much as or as little as you like). When vegetables are done and cooled a little ad to your salad and toss again. Top with blue cheese and almond slices.